I used my MISTI to make a background with sugar skulls from a Hero Arts stamp set. Then, I realized I messed up part way through. I salvaged the good part with a circle die. Supplies: Stamps – Hero Arts, Papertrey Ink, paper – Neenah Classic Crest Solar White, Poptone Razzle Berry, Stampin’ Up! Basic Black, inks – Stampin’ Up! Green Galore (retired), Only Orange (retired), Pink Passion (retired), Tempting Turquoise (retired), VersaFine Onyx Black, dies – Spellbinders, embossing folder – Darice, embossing powder – Stampendous Detail clear. 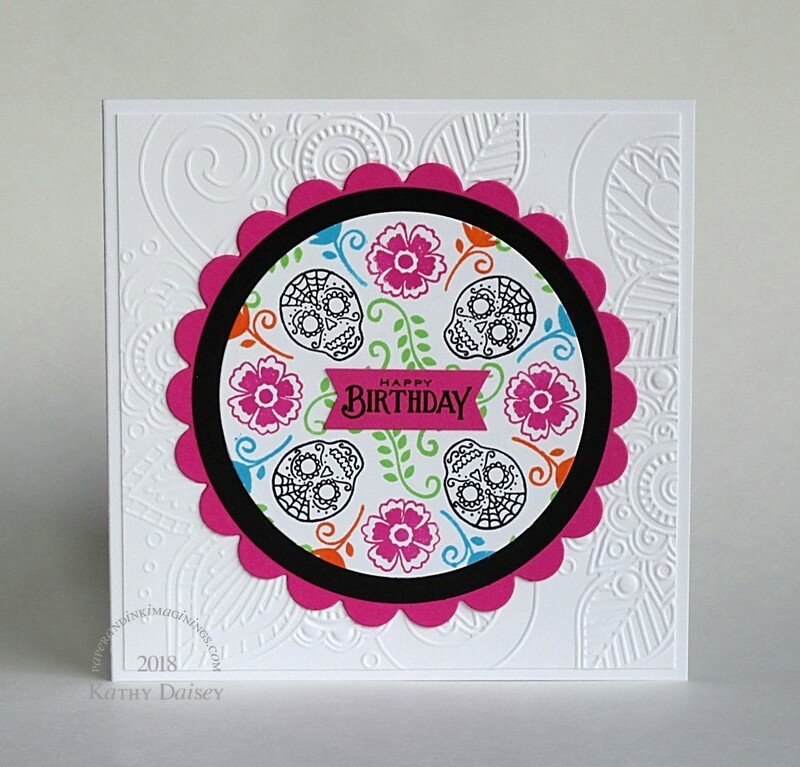 Categories: birthday, card | Tags: card, Darice, Hero Arts, Neenah, Papertrey Ink, Poptone, Spellbinders, Stampendous, Stampin' Up!, Tsukineko, VersaFine | Permalink. Best card ever! Loved it. Hugs & Kisses! See you this afternoon!